Working together since 2015, SlimPay has helped UNICEF Slovenia to increase donors conversion rate by simplifying their acquisition. The United Nations International Children’s Emergency Fund (UNICEF) is the United Nations agency that since 1946 has been responsible for promoting and defending the rights of children, and ensuring that they are respected for all children and adolescents in the World. UNICEF works in 190 countries and territories to save children’s lives, to defend their rights, and to help them fulfil their potential. By meeting their basic needs and promoting their full development, including by ensuring their health, education, equality and protection. And this in the long-term, as in emergencies, and placing the most disadvantaged and excluded children at the heart of any action. What is the struggle with acquiring Donors? To become a full donor, for UNICEF Slovenia, some paperwork was needed and this was negatively impacting the donors’ acquiring. Donors want to do donations right away, they do not want to fill in paper documents, physically going to the Post Office to send back the documents to UNICEF, they just want to help in-need children around the world without having to go through all these bureaucratic processes. Therefore, electronic mandate signature process has been the right upgrade to help interested donors convert into actual ones quickly, avoiding to lose them during the telemarketing acquiring process. 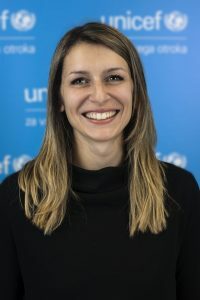 Maša Dakič, Head of Monthly Giving at UNICEF Slovenia explains, the aim of UNICEF is to create a simpler and smoothlier process possible for their donors to make the process of becoming UNICEF donors very easy and quicker for them. She also added “Through SlimPay payment solution we can definitely achieve our goal and acquire higher number of donors thanks to their frictionless User Experience Checkout to onboard customers”. “The main struggle for UNICEF was to make interested donors effective ones as only ⅓ of the prospect donors claiming to be interested over the phone were actually signing the mandate and sending it back signed, sealing the donors contract. Due to the paper process, we have lost a great number of possible donors as the process was requiring too much effort from their side”. Maša also added “Since the integration of SlimPay direct debit solution, we have experience an increase of fulfilment rate, the number of monthly donors has doubled ( prior the introduction of SlimPay only 25-30% of contacted prospects were converted into official donors whilst today thanks to SlimPay solution, the number of donors acquired throughout telemarketing is around 60% ) in the past 2 years as we had introduced electronic mandate technology to our process”. “Moreover, eliminating all the paperwork has lead to a great time management as it helped us to save time which we could use to hunt additional prospect donors, and move forward on fulfilling UNICEF commitment on improving children’s lives around the World”, Maša concluded. This boost in donors conversion rate has made it possible for UNICEF Slovenia to also increase its revenues thanks to the higher amount of donors. Now, UNICEF Slovenia is looking forward to move a step further and introducing SlimPay Checkout solution directly on the website allowing a greater number of interested donors online to help children around the Globe.